Exposing a scandal at the VA hospital was Dr. Cooper Logan’s responsibility, and his first mistake. The world was background noise as Cooper worked to save lives. He’d won his scholarship wrestling and keeping Death off-balance was his new passion. But, politics wasn’t what Cooper was interested in and learning them the hard way cost him his residency. But when the nurse who had betrayed him turns up dead Cooper’s life begins to unravel. And the danger he faces now has Death staring him in the face. We caught up with retired cardiac surgeon Dr. Thomas Jay Berger to ask him what it was like to go from surgeon to award winning writer. He agreed to give us some inside scoop about his journey. Tell us about your journey as an author writing this book. How long did it take? How much research did you do? What did your friends and colleagues say when they found out you were writing a thriller? In 2002 I took the only writing workshop I have ever attended. I had to write a short story to bring to the class as a teaching tool. My short story, Incompatible With Life, was based on my experiences as a surgery resident in Birmingham. I later submitted that story to the Faulkner-Wisdom Creative Writing Competition and it won first place over 700 other entries. With my skills as a writer validated I decided to create an entirely new literary form. I would write a novel following all the usual rules for a novel but with one exception. Instead of building the novel out of a series of chapters I would build the novel out of a series of short stories. Incompatible With Life would be one of the short stories. I thought this was a brilliant idea and spent years working on it. As it turned out, I was the ONLY who thought it was a brilliant idea. So finally I bit the bullet, gave up on being the creator of a new literary form, and just expanded the short story itself into a normal novel constructed from chapters. 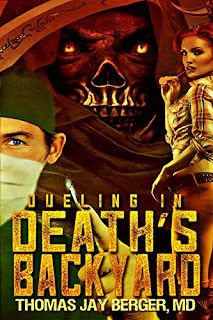 Along the way, the title morphed into Dueling in Death’s Backyard. After thousands (it felt like thousands anyway) of rewrites, Dueling was published in 2015. So you might say it was over ten years in the making. Tell us about your own background, about what you do when you’re not writing and what you’re doing today. Retired from active surgical practice due to vision problems, my wife and I bought a 50 ft. sailboat and sold or gave away everything that wouldn’t fit on board. We spent about 8 years sailing all around the Caribbean. Three years ago we settled in Miami, where we each have moms in their nineties who need us to be close by. Other than my medmail expert business, I box twice a week, pump iron twice a week and try to get to the shooting range whenever I can. If one is going to write thrillers with action scenes, including fist and gun fights, one should have a clue how to actually do these things. A famous medical thriller writer (who shall not be named) once wrote a gunfight scene where a revolver did not fire because the safety was on. He apparently knew absolutely nothing about firearms – not even the basic fact that revolvers do not have safeties. Fistfight scenes by meek or sedentary authors are often even worse – describing techniques that would never work in real life. I am proud of my OR scenes, which no one but I could ever write. But I am also proud of my action scenes which my own knowledge, experience, and constant training allow me to portray realistically. Who inspires you as an author? Dueling was inspired by my mentor, the late Dr. John Kirklin, the real life Dr. Kirkwood. Dr. Kirklin was the first person to do a series of open heart operations with a heart-lung machine. He is the true Father of Cardiac Surgery, although that title is often wrongly attributed to C. Walton Lillehei. Lillehei used another human being as the heart-lung machine for his operations; a technique that soon hit the dustbin of surgical history. Lillehei is no more the Father of Cardiac Surgery than Elvis is the King of Rock ‘n Roll; a title that clearly belongs to Jerry Lee Lewis. Dr. Kirkwood, in Dueling, IS Dr. Kirklin. I hope that the novel will give immortality to my mentor, a remarkable and fascinating man and the true Father of Cardiac Surgery. What inspired this particular story? Why Cooper’s story? What does your wife think about your becoming an author? My wife, Red, has been totally supportive of my writing and is always the first to read everything I write. While we were cruising she would often be working on the teak deck of our boat in the hot sun while I was writing in the air conditioned comfort of our boat’s salon. Her input has been of tremendous help in making my female characters realistic and in making Dueling speak to female readers. In Red’s amazing life she has associated with Miami smugglers back in the sixties and flown planes and helicopters. At 5’ 2” and maybe 107 pounds soaking wet, she also drove an 18 wheeler for a few years. She loves adventures as much as I do and we had many of them while cruising the Caribbean. Our lives have depended on each other more times than I can remember. She is part of everything I am and everything I do, including the writing. DUELING IN DEATH’S BACKYARD is an intensely, fast-paced medical thriller written by retired cardiac surgeon Thomas Jay Berger, MD who is the winner of a Faulkner award for writing. Exposing a scandal at the VA hospital was Dr. Cooper Logan’s responsibility, and his first mistake. The world was background noise as Cooper worked to save lives. He’d won his scholarship wrestling and struggling with Death in the operating room was his new passion. But, hospital politics wasn’t Cooper’s strong point and learning them the hard way cost him his residency. Then, to make matters even worse, the druggy nurse Cooper had exposed, turns up dead and Cooper is framed for the murder. Now Cooper must duel with death outside the OR and this time it’s his own life that’s at stake. And the danger he faced now had Death staring him in the face. Retired from active surgical practice due to vision problems, my wife and I bought a 50 ft. sailboat and sold or gave away everything that wouldn’t fit on board. We spent about 8 years sailing all around the Caribbean. Three years ago we settled in Miami, where we each have moms in their nineties who need us to be close by. Other than my medmal expert business, I box twice a week, pump iron twice a week and try to get to the shooting range whenever I can. If one is going write thrillers with action scenes including fist and gunfights, one should have a clue how to actually do these things. A famous medical thriller writer (who shall not be named) once wrote a gunfight scene where a revolver did not fire because the safety was on. He apparently knew absolutely nothing about firearms – not even the basic fact that revolvers do not have safeties. Fistfight scenes by meek or sedentary authors are often even worse – describing techniques that would never work in real life. I am proud of my OR scenes, which no one but me could ever write. But I am also proud of the of action scenes which my own knowledge experience and constant training allow me to portray realistically.